Thank you for choosing accusonus ERA Voice Leveler . In order to better understand the main concepts and operation of ERA Voice Leveler , please take the time to read this user manual. 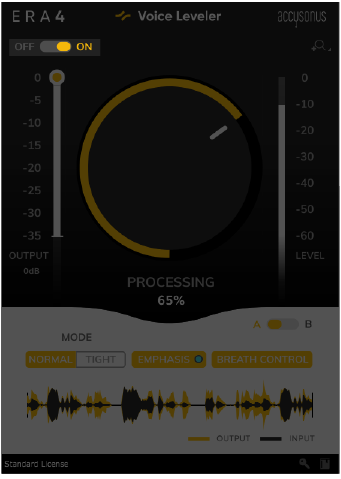 ERA Voice Leveler is a one-knob audio effect plug-in that automatically balances the level of your audio. 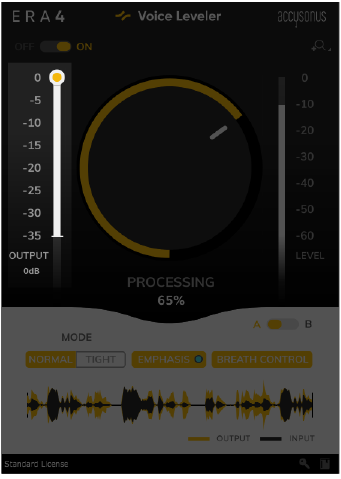 Based on the multi-patented accusonus algorithms, ERA Voice Leveler simply works and allows your audio to have consistent levels throughout a recording, especially on speech and dialogue cases. You can find the latest ERA Voice Leveler installer in your accusonus "My Account" page, in the “Downloads” section (https://accusonus.com/dashboard ). For more information about installation and activation see the Activation Manual, which you can find along with the installer. ERA Voice Leveler supports the following sample rates: 44.1 kHz, 48 kHz, 88.2 kHz, 96 kHz. Warning: ERA Voice Leveler is designed to be used as an audio effect plug-in inside Digital Audio Workstations or Non-Linear Editing systems. Only the plug-in formats listed above are supported. ERA Voice Leveler does not operate as a stand-alone application . Warning: There are just too many combinations of DAWs and plug-in formats out there, so there's always something we might have not tested. If you don't see your DAW above, you can always download the free, fully-functional 14-day trial and see if ERA Voice Leveler is supported for yourself. If you encounter any problems, let us know at support@accusonus.com . This is the main control of ERA Voice Leveler. Most of the time you don't have to do anything else. Just dial in the amount of processing you want and you're done! The knob values range from 0% to 100% and control the amount of processing applied to the audio signal. Tip: You can double-click on the control to reset it to its default value. 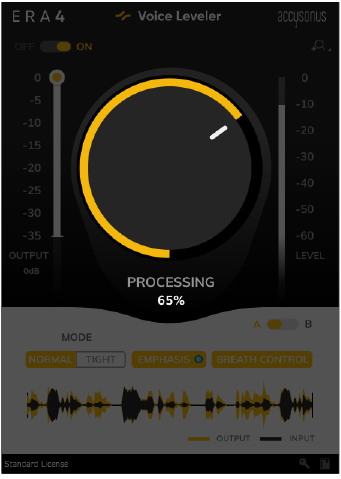 The processing mode affects the way Voice Leveler analyzes your signal and adapts the internal processing parameters. Use the default, Normal mode for a more natural processing, or use the Tight mode to make the processed signal more pronounced. On the right side, there is the Emphasis button. You can enable this button, to apply an automatic and smooth tonal balancing on the processed signal. This setting will add an extra presence and liveliness to the sound, but only if it detects it's needed. Example: Do you work with podcasts? Enable the Tight mode and your voice recording will have a more focused character. If you work with background music, this setting will probably make your voice ``sit`` better in the mix. Tip: The Emphasis button has a led indicator next to the button name. 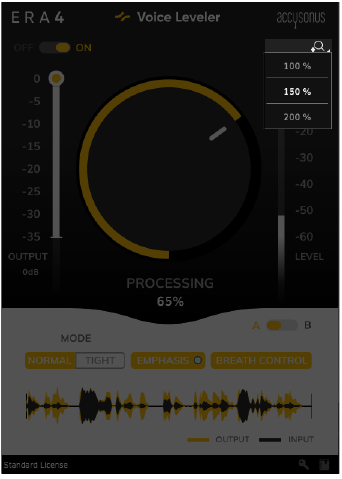 This indicator informs you when Voice Leveler detects that your audio recording is not tonally balanced and will automatically process it to fix this. The audio output of ERA Voice Leveler is always louder than the input audio, because it essentially increases the level of the quiet parts of your recording to match the levels of the loud parts. The output gain allows you to adjust the level of the balanced output signal to the rest of the elements of your session. Note that this gain is also bypassed when the ON/OFF switch is set to OFF. This is very helpful when comparing the original and the processed signals. At the bottom of the plug-in window you can find a waveform view. 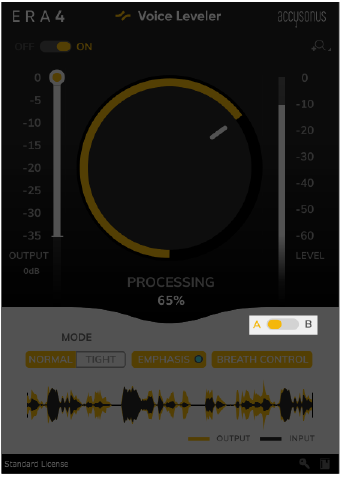 Here, Voice Leveler will show the input (with black) and output signals (with yellow) to help you quickly understand how much processing is applied and how each part of your recording is affected. There might come a time where you're not sure which setting is better. Note, that you can adjust the plug-in controls (Processing, Output Gain, Mode & Emphasis) independently for the A and the B setting. You can use the A/B switch to quickly compare two settings and help you in your decision. The ON/OFF switch allows you to turn on or off the plug-in processing. When the switch is at the OFF position, all processing is bypassed and the original signal comes through ERA Voice Leveler untouched. ERA Voice Leveler offers the option to resize the plug-in window. This can be especially helpful if you have large or high-resolution screens or you just want to focus on a specific task. Click the zoom icon at the top right corner and choose between three settings.